The Collaborative Poll program is a research service offered by CMOR to organizations and agencies with an interest in knowing what county residents think, know, and want. Each poll is an annual telephone survey that includes questions posed by multiple organizations in which each participant pays for only those questions necessary to meet their information and research needs. It is an affordable and easy method of collecting information on opinions & attitudes of county residents. The program was started at the University of Akron in 1999 and continues today at CMOR. 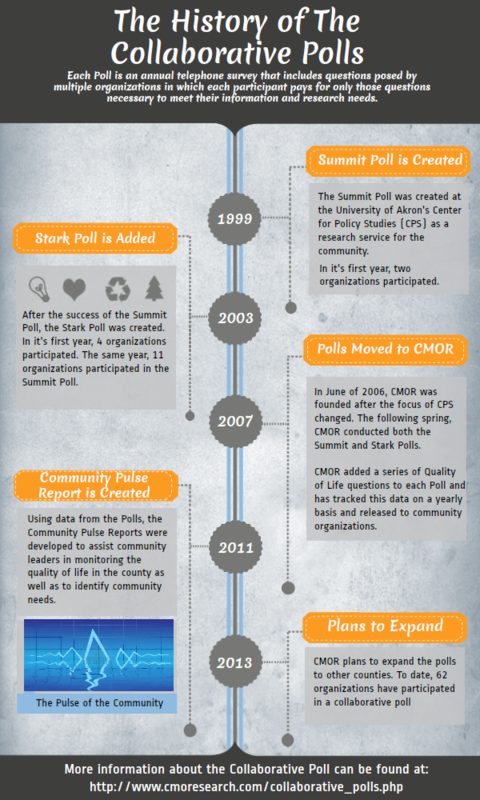 The Infographic below depicts the history of the Collaborative Polls from inception to now.